Julia Mustonen-Dahlkvist is professor and Head of the Piano Department at the Ingesund college of Music at Karlstad University. She is Blüthner Artist and Genuin Records Artist in Germany. She is first prize winner in Nordic Piano Competition in 2004 and has received prices and awards in the Finnish Culture Foundation in Finland, Anders Wall foundation in Sweden and Sonning Scholarship award in Denmark among others. In a past few academic years Prof. Jula Mustonen-Dahlkvist was giving master courses in Latvian Academy of Music in Riga, Denmark Odense Music Academy, Ireland Royal Academy in Dublin, Sibelius Academy, Brussels Conservatory, Musikhochschule in Köln among others. Many of her students are international laureates and many are competing on a WFIMC level and she is frequently invited to be on the jury of national and international piano competitions. 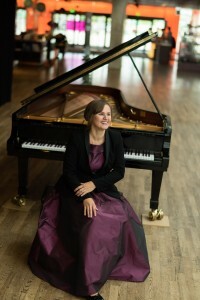 Prof. Julia Mustonen -Dahlkvist is the artistic director of Gafsfjordens Music Festival, president of a Ingesund Piano Foundation and artistic leader for the Nordic Piano Competition from 2016. Competitions have become a very important platform for the young artists to get on international stage, to get international attention and even to get a huge international breakthrough. General professional level of the performances at competitions at WFIMC level has risen tremendously and the number of pianists who are applying to compete in the 1st and 2nd league competitions is getting higher and higher. In our time of social media and live streaming – everything has changed. Suddenly the whole world can follow everything and build its own opinion. By getting the international public on your side it is possible to get international attention without even making it to the finals or getting top prizes. We are entering the new era of “usefulness” of piano competitions. It is very important for young artists to know how to prepare and how to choose a program for the competitions. Preparation to a competition has a very special routine, because the performance has to be polished and planned to the last detail, the stability and musical ideas of the performance has to survive a very shaky and uncomfortable situation, where you are being judged. It is also very important to know where to go, where will you be treated fairly and well. I hope, that during my lecture I will give you many answers about the world of piano competitions and you will be welcome to ask me any questions, what I will be delighted to try to give my answers to.